As we get older, we all begin to take stock of our lives and try to figure out where we've been and where we're going. Many people, taking inspiration from the film of the same name, assemble their own personal "bucket lists" of things they want to do before it's too late. 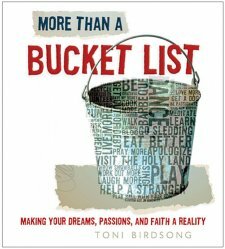 In the book More Than a Bucket List, author Toni Birdsong gives advice on how to assemble your own list, and ties many of her suggestions to Biblical passages. Conveniently, the back of the book contains blank pages for the reader to work on his or her own list. While many of the ideas listed sound fun or inspirational ("Pay the tab of the person behind you," "Visit Ground Zero," etc. ), others are just plain strange. For instance, there's the suggestion that you should "Live long enough for Willard Scott to show your face on a jelly jar." I had no idea that living to be 100 was something we all could do if we just put our minds to it. Other suggestions sound downright illegal, such as "Walk through Disneyland after hours." Of course, there are no directions included as to how to accomplish that, so whether you should hide somewhere until after closing, or just break in is not stated -- I guess it's your Bucket List, so do whatever suits you! There are also an awful lot of suggestions that begin "take the day off," "skip work," "leave work early" and so on. This coupled with extravagantly expensive travel-related suggestions ("Visit the 1200 islands of Maldives," "Summit Everest," "Raft the Zambezi," etc.) makes you wonder how anyone can follow many of the ideas and remain employed for long. The sections sprinkled throughout the book labeled "Real-Life Challenges" are more practical and involve suggestions such as volunteering at a homeless shelter and asking advice from people you admire. While I realize that the book is a sort of wish list, I would have enjoyed it a bit more if it had leaned more toward the practical, or achievable for the average person. Good review - I'm debating whether or not to request this book.